What: The Maine Department of Agriculture, Conservation and Forestry has adopted rules (PDF 38KB) (DOC 69KB) that prohibit the sale of 33 terrestrial plant species determined to meet the invasive plant criteria described in the rule. When: The new rule went into effect on January 14, 2017. As specified in the rule, the prohibition of sales does not begin until January 1, 2018. Businesses selling any of the 33 invasive plant species have until December 31, 2017 to sell any remaining stock. Documents: The new rules are based on comments received during the December 8 public hearing and written comments received during the open comment period. The response to comments and basis statement for these rules are public documents. Plants listed below are illegal to import, export, buy, sell or intentionally propagate after December 31, 2017. The ban includes all cultivars, varieties and hybrids of these plants. Terrestrial Invasive Plant Poster (PDF 4MB) Full size printer versions (PDF 26MB) (PUB 79MB) Large files. 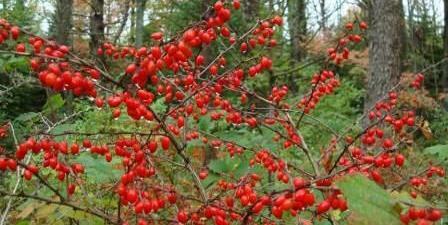 Species links go to fact sheets that help with identifcation and control..
Invasive plants are a direct threat to what we value about Maine's natural and working landscapes. The aggressive growth of invasive plants increases costs for agriculture, can affect forest regeneration, threatens our recreational experiences, and reduces the value of habitats for mammals, birds and pollinators. Species like Japanese barberry and multiflora rose can form thorny, impenetrable thickets in forests and agricultural fields. Invasive species are the second-greatest threat to global biodiversity after loss of habitat. Invading plants out compete native species by hogging sunlight, water, nutrients, and space. They change animal habitat by eliminating native foods, altering cover, and destroying nesting opportunities. Some invaders are so aggressive they leave no room for our natives. 2007 - DACF is directed by the legislature to study invasive terrestrial plants, the Commisioner appoints a stakeholders group to provide input on developing criteria for listing potentially invasive terrestrial plant species that could impact natural ecosystems. Plants evaluated using the criteria developed would be those commercially distributed and not necessarily weeds in the landscape. 2011 - A new rule is adopted outlining the criteria for listing invasive terrestrial plants. 2015 - The Invasive Terrestrial Plants Workgroup finishes reviewing 38 plants to see if they meet the criteria set forth in the 2011 rule. Thirty-three of the 38 plants were found to meet the criteria and five did not. 2016 - DACF proposes changes to Ch. 273 Criteria for Listing Invasive Terrestrial Plants (DOC) that could restrict the sale or ditribution of the 33 plants found to meet the criteria. 2017 - DACF adopts Ch 273 (PDF 38KB).